Will uranium supply be adequate for planned nuclear electricity? This question has seen sharply differing views. The purpose of this post is to give an update, showing where we are now. The supply situation is recently looking better, partly because of an increase in uranium supply from Kazakhstan and partly because of cutbacks in plans for new reactors in response to the Fukushima accident. Reactors are very long-lived, however, and providing sufficient long-term uranium supply when oil supply is declining due to peak oil may be a challenge. Figure 1 shows a history of uranium consumption and uranium mined. The reason that supply from mines can be less than current uses is because some of the supply is from previously mined uranium. Back in the 1950s, 1960s, and 1970s, far more uranium was mined than was needed for peaceful purposes. A large part of this excess uranium was used by both the United States and the Soviet Union to make nuclear bombs. Some of it was stockpiled as well. Since governments don’t normally give out details relating to strategic materials, not all of the details are known regarding the uranium mined during the early period. For example, we don’t know precisely how much uranium was mined by the Former Soviet Union (Figure 1 shows one estimate), and we don’t know how much excess military inventory Russia has today. We do know that a large amount of this previoulsly-mined uranium has made its way to the uranium marketplace. Starting in 1994, the Russians entered into a 20 year agreement called Megatons to Megawatts to sell recycled nuclear bomb material to the United States, for use in nuclear power reactors. Since this program is scheduled to end in 2013, one question that has been raised is whether the marketplace will be able to create enough increased production soon enough, to meet the market’s needs. Several studies were done that came to the conclusion that there likely would be a gap of some kind–too slow ramp up of new mines, or concerns about inadequate reserves, or “peak uranium.” One of these was a study in 2001 by the International Atomic Energy Agency. Another was a study by Energy Watch Group in 2006. The Oil Drum ran a series of four posts by Michael Dittmar in 2009 that also forecast shortages. Individual commenters have questioned whether these studies were correct. The huge overhang of excess inventory depressed prices. With so much supply flowing into the marketplace from recycled bomb material and other inventory, there wasn’t a need for a great deal of current production. Perhaps the relatively low reserve numbers simply reflected the low prices of the day. Now that we are getting closer to the 2013 date, we can see better what is actually happening in the market place. We know that 2013 is not an absolute cut off. Russia may still continue to sell some recycled bomb material, although it will no longer will have an obligation to do so, and the prices will likely be higher. The United States also has a considerable amount of excess inventory that with reprocessing could be used by nuclear reactors. (See 2008 report and 2009 presentation). We can also see from Figure 1 that for the year 2010, uranium mining is producing 78% of current use–a big improvement over the situation a few years ago. US legislation passed in 2008 placed annual quotas on Russian imports, presumably to try to help markets function more normally. Figure 2. World uranium production by country, based on data of the World Nuclear Association. Recent uranium production is higher because of increased production from Kazakhstan. Apart from Kazakhstan, production is flat or slightly declining. Kazakhstan claims that it has the ability to eventually ramp up production to 30,000 metric tonnes per year, but indicates that it is planning an output plateau of 20,000 to 25,000 metric tonnes a year. Its production was 17,803 metric tonnes in 2010, so it is not too far from its planned plateau. YELLOWCAKE export out of Port Adelaide is poised to increase almost sevenfold over coming years. About 5000 tonnes of uranium oxide, or yellowcake, is now shipped out of Port Adelaide, but a combination of new SA mines, the Olympic Dam expansion and new West Australian mines will lift exports to about 37,000 tonnes a year in about 15 years. So the uranium / nuclear plant balance doesn’t look as bleak as a few years ago. Uranium production is now rising because of supply from Kazakhstan, and more production elsewhere is planned. One thing that is helping supply is higher prices. Prices are clearly substantially higher since 2008, and these higher prices seem to be stimulating supply. (Spot prices are now $54.25, or a little higher than recent average contract prices. Most uranium is sold on long-term contracts.) It takes several years for new mines to ramp up, so some of the higher price effect is not yet being felt. 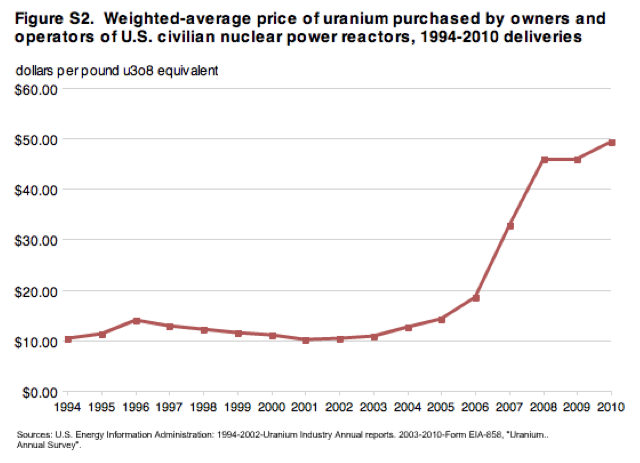 At its current price, the cost of uranium is only a small share of the price of nuclear electricity. According to the World Nuclear Association, as of March 2011, uranium costs amounted to the equivalent to 0.77 cents per kWh, which is less than one-tenth of the typical sales price of electricity. Because of this, there would seem to be “room” for uranium prices to rise further, without being a major obstacle to electricity sales. 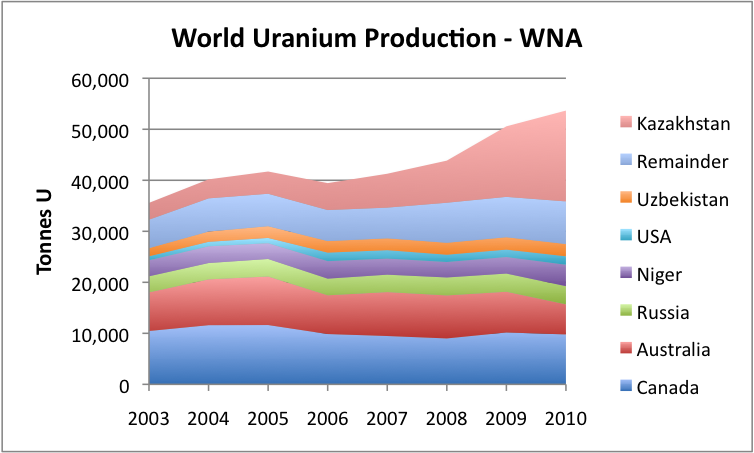 In the United States, uranium production has varied (Figure 4). 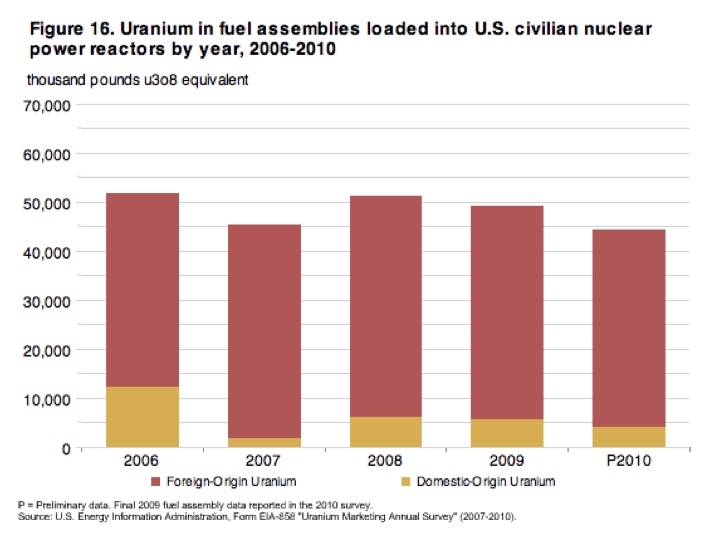 Even at the higher production levels since 2006, uranium production is still very low compared to the amount used by the United States (Figure 5). Clearly, the adequacy of uranium supply depends partly on demand–how many reactors are being built or being taken off-line. Figure 6. Nuclear power generation by part of the world, based on BP Statistical Data. 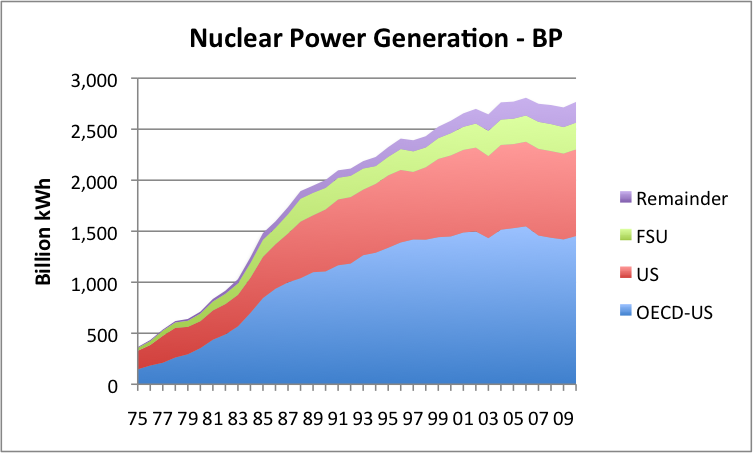 Figure 6 shows that electricity from nuclear power plants grew rapidly in the 1970s and 1980s. The number of new plants tapered off after the Three Mile Island accident in Pennsylvania in 1979, although ones in the planning stages at the time of the accident were still built. Since 2004, nuclear electricity production has been on a bumpy plateau. 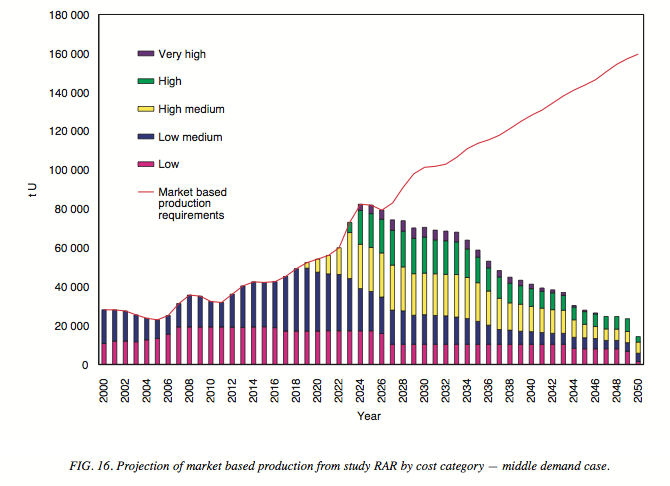 Because of the lack in growth in nuclear use, there has not been much need for new uranium production, except to offset the longstanding shortfall in uranium mined compared to current use. Now, following the Fukushima accident in Japan (March 11, 2011), many countries are again rethinking their commitment to nuclear power generation. Germany has closed eight of its older nuclear reactors permanently and is making plans to close the other nine by 2022. A referendum in Italy has rejected a plan to generate 25% of the country’s electrical power from nuclear by 2030. Switzerland has said it will not replace its five nuclear power plants when they reach the ends of their useful lives. In the absence of changes because of the Fukushima accident, the World Nuclear Association information shows that a large number of nuclear facilities are under construction, planned or proposed. If all of the nuclear power plants that have been proposed are actually built, nuclear generating capacity would more than double from the 2010 level. Just adding the reactors that are under construction or planned would increase world nuclear electricity capacity by 62%. The two countries behind China in adding new reactors are Russia and India. Russia currently has 10 nuclear power plants under construction, 14 planned, and another 30 proposed, making a theoretical total of 54. India has 5 under construction, 18 planned, and 40 proposed, for a theoretical total of 63 new reactors. The list of countries planning new reactors is very long, and includes many from the “Emerging Markets,” including Bangladesh, Pakistan, Turkey, and Vietnam. What seems likely to happen is that some OECD countries will scale back their nuclear power plans, and even take some off-line, after the Fukushima accident. It is not as clear that the rest of the world will take similar actions. Electricity use has been rising much more rapidly outside the OECD than in the OECD. As a result, many of the countries outside the OECD see a pressing need for new sources of electricity, and few other good options. I would expect that many of these countries will go forward with their nuclear plans if they can figure out the financing to make these plants feasible. They may find ways to cut corners (like putting them next to the ocean, with once-through cooling with sea water) to keep costs down. If planning is not good enough, short-cuts can raise accident possibilities, though. Figure 7. IEAE Uranium Supply Forecast from "Analysis of Uranium Supply to 2050"
Besides finding additional uranium supply, there may be other “work arounds.” With nuclear energy, there is at least the possibility of reprocessing spent fuel, but suitable reprocessing facilities need to be built in advance, if this is the plan. There is also the possibility of thorium being used in some of the yet-to-be-built reactors, if the details of making thorium work can be figured out. One question those building nuclear plants should be thinking about is, “What impact will peak oil have on uranium availability?” Theoretically, uranium production can go on as before, if there is sufficient oil for essential services (extracting the uranium, maintaining the roads, raising the food that the workers need to eat, and transporting the uranium to where it is used, for example). Whether or not this whole process can go on for the 50 or 60 year lifetime of reactors now being built is an open question. Adequate oil supply will also be needed during the period of decommissioning, and for servicing spent fuel, after the reactors close. Back in 2009, Michael Dittmar and Brian Wang made a bet regarding how world uranium production would progress and how nuclear power generation would progress, with Michael Dittmar betting on the low side, and Brian Wang betting on the high side. For the year 2010, it looks as though Brian Wang won both bets. Brian Wang bet that uranium production would be above 50,500 metric tonnes. World uranium production was 53,663 metric tonnes, so Brian was the winner. With respect to electricity generated from nuclear energy, the dividing line between the two bets was 2,630 billion kWe. Actual generation was 2767 billion kWe according to BP’s Statistical Review of World Energy, so again Brian is the winner. There is no actual money changing hands with respect to this bet. The only prize I remember hearing about was a possible bottle of wine for me. This entry was posted in Alternatives to Oil and tagged nuclear, nuclear electric, peak oil, uranium. Bookmark the permalink. I don’t really understand what people are saying here. Are you guys saying that there will be a larger supply of uranium (because of stockpiling in Kazhakstan) in the future compared to the demand of uranium? And there fore push the price down? Or are you saying that uranium has peaked and will be more expensive? I am saying that we are making progress in extracting more uranium. As far as we know, Kazakhstan is producing more uranium now–look at Figure 2. At one time it looked like there would be a big shortfall in uranium production. Now, at least for the short term we can see, it looks like that there be enough, especially considering that there are stockpiles. But once peak oil hits in full force, it is going to be harder to have enough oil for mining. So we may still have a problem, but not today. So you don’t think that the uranium price in short term (5-10 years) might go to the levels which we saw in 2007? 10 months ago we saw a significant increase in price even though increased production and stockpiles. And if Fukishima accident would not have happend I would be really suprised if it not had continued its increase. Won’t the 61 reactors that are under construction increas the demand significantly when they are taken into use? “The plan calls for a Mini-FUJI Reactor R&D investment of $300 million over a 6 year period of time, with sales beginning in the 5th year. By the 7th year sales are anticipated to reach the level of 50 units a year, and that is expected to reach 200 unites a year by the 10th year. Mini-FUJI reactors are expected to produce 10 MWe and sell for $60 million. The initial manufacturing cost is anticipated to be approximately $40 million, and that figure is expected to drop to $30 million as production rises. Sales are anticipated to reach $12 Billion by the 10th year, with an assumed gross profit from sales of 30%. Thus the potential after tax income of IThEMS would run to $2.5 billion. And this would be before IThEMS brings its major product, the 200 MWe FUJI reactor to the market. As I understand it, thorium is not yet a proven technology, and is also a potential producer of highly poisonous products, at least in the short term. I, for one, cannot be sanguine about relying on an as yet unproven technology and yet another toxin producing process in the human economy. Even assuming thorium based fission works out very nicely as a method of generating heat, I do not now trust humans to manage affairs well; our track record is very poor. If I were a metaphorical credit rating firm considering a metaphorical thorium reactor credit rating for humanity, I would be very doubtful of humanity’s credit worthiness. If one is pro-thorium reactors they say it is proven by the reactor Oak Ridge ran in the 60s. If one is anti-thorium reactors they say no one has even built a commercial scale reactor. So one can take ones pick on that point. A thorium reactor does produce radioactive waste but much less and shorter lived than uranium. It needs to be stored for 300 years versus 100,000 years. Desperate people will do desperate things. I have no doubt that nuclear technology can, in theory, meet our needs in a satisfactory manner. However, the thing to keep in mind is the reality of our political technology. It is completely inadequate to ensure that the interests involved (public and private) can be trusted in their current form, or even designed on a whiteboard, to ensure continued safety or satisfactory utilitarian compromises. Such a design is simply unprecedented. Nuclear energy has the potential (and frankly, the reality) to name winners and losers on a scale that is unprecedented in any other area of energy development policy. Capital interests have always held sway over quality of life issues for the majority, and safety is negotiable based on oversight and raw valuation of actual lives. The other side of the coin is that, just like oil and gas, US uranium stocks consist of small amounts of relatively easily extracted/processed (cheap) reserves alongside a majority of very costly reserves. The gradients that separate the difficulties in extraction are far steeper than for petroleum. And the costs go well beyond financial impacts as the largest reserves would, using today’s technologies, place the largest deposits of fossil water in North America both at demand for use in extraction and simultaneously at risk of contamination from mining (rendering them less useful or useless as an agricultural or domestic commodity). Investments in using vastly less energy per unit of economic output is still a path least subject to scarcities and volatility. That in itself has value now, and will skyrocket in value in a future paradigm to levels that warrant investment. At the moment, and for the foreseeable future, our well-being is inextricably tied to energy consumption’s volatility and price as a factor of production. Imagine an “economy” where the key factors in its citizens’ well being and health was isolation from scarce energy as the crucial factor of production, or high worker skill levels, or ….